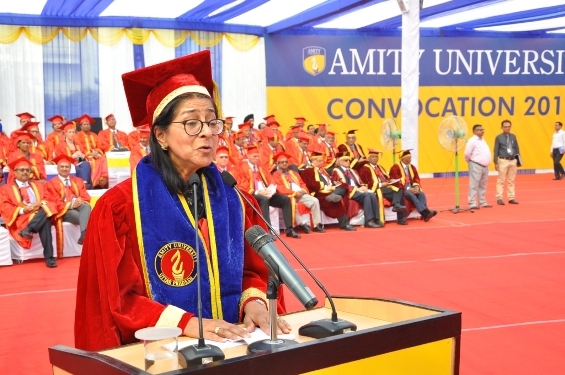 On the last day of three day Convocation 2018 of Amity University Uttar Pradesh,more than 7700 successfully qualified graduands from Management Domain including Management Programmes of other Domains plus Flexi Mode, Distance and Online Programme received their degrees and diplomas at University Campus,Sector-125, Noida. 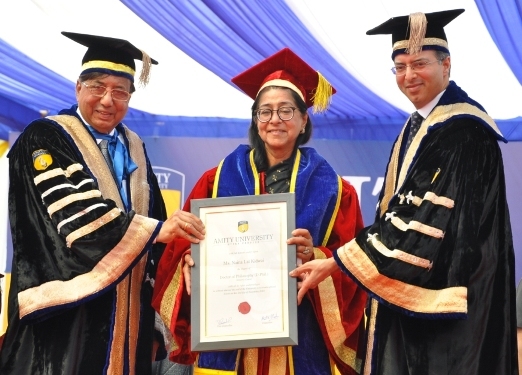 Mr. Ajit Doval, National Security Advisor to the Prime Minister of India and Ms. Naina Lal Kidwai, Former Group General Manager & Country Head, HSBC India were awarded Honorary Doctorate Degrees in Philosophy. 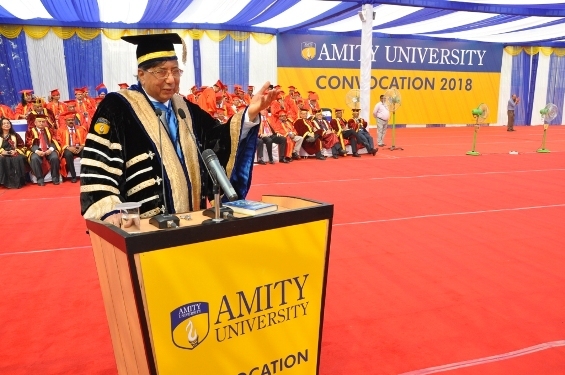 Addressing the graduands of Amity as ‘Distinguished Class of People’, Dr. Ashok K Chauhan, Founder President Sir, Amity Education Group said that every Amitian is destined to be successful as they are nurtured to work against all challenges by providing them with holistic global education along with imbibing traditional values and ethos which aid them to stay focus both professionally and personally. He shared that mantra of success which he lucidly explained through the acronym BHAAG where B stands for Behavioral Science, H stands for Hardwork with Strategy, A for Attitude, another A for Ambition and G for God.He called upon the graduands to learn the mantra of BHAAG by heart and implement in their lives through which they will be able to convert all the adversities into opportunities. Dr. Chauhan urged the students to be inspired from Prime Minister Narender Modi who with his tireless efforts has brought India upwards on global rankings. Accepting the honorary doctorate degree, Mr. Ajit Doval, National Security Advisor to the Prime Minister of India expressed his gratitude for the honor and lauded Amity Education Group for bringing laurels to the country by leaving footprints of India at global level. He commended Amity for contributing in nation building by nurturing the future of lakhs of students in India. Sharing his views on future of world in the field of technology, weapon, business, etc,he apprised that the one thing which will make the most difference in coming times will be ‘rare earths’- found in earth with high potential such as radio materials, uranium. He pointed out that China has got the major portion of rare earths deposits while India is scanted. He elaborated that India envisions to be the major power of the world has one major resource which is ‘rare human wealth’ with 50% of the population below 25 years of age and the advantage of this demographic dividend will be with us fora long time. He remarked that the edge of having young manpower has to be converted into an asset since the present and upcoming generations are in the luckiest time with wide spectrum of opportunities. Mr.Doval averred, “If the youth is not channelized by making them profitably employed, then that can be a source of great problems. They can be channelized if one possess right capabilities and intentions” He called upon the youngsters to develop the knowledge, skills and right attitude to serve the Nation. He advised the entire progress of life can be directed and evaluated by noting three important points, i.e right assessment in knowledge of where one stand currently, focus on where you want to be and which path one must follow. “The problem with Indian youth is that they spend proportionately much higher time by dreaming on where they ought to be in future, which is important but it is also necessary to focus on the route.” opines Mr. Doval. He advised the graduands to take care of their today by taking constructive measures which will eventually lead them towards success. Delivering her acceptance speech, Ms. Naina Lal Kidwai, Former Group General Manager& Country Head, HSBC India said that she is affirm believer of everyday learning and expressed her delight to learn the mantra of success i.e BHAAG from Dr. Ashok K Chauhan. She asked the graduands to remember that it is in aperson’s hand to define their future and make a difference in the world.Highlighting the two important aspects of life, she advised the graduands to realize the importance of time and use it wisely. She further suggested them to spend time in putting extra efforts towards sustainable actions which help them long way to achieve success. Ms. Naina emphasized upon investing time similarly the way a person would invest the money and spend it bringing a positive change in other’s lives. Congratulating the graduands, she apprised that success is measured by the impact we make and not just by the financial growth. It is the challenging moments that define a person. During the occasion, Mr. Mark Powell, Executive Director for Schools of Built Environment was conferred upon Honorary Professorship by Dr. Ashok Chauhan and Dr. Atul Chauhan. During the three day convocation, more than 15000 graduands from over 140 programmes received their degrees and diplomas. A total of 224 Gold Medals, 222 Silver Medals, 123 Bronze Medals and 117 PhDs were awarded to the meritorious students. Also, 164 students were awarded Baljit Shastri Award and 65 students were awarded Best All Round Student Trophies.